The popular Tioman Island or locally known as Pulau Tioman is one of the top tourist destinations in Malaysia where located in the state of Pahang in Peninsular Malaysia. The cheapest and easiest way to visit this small island is by booking Blue Water Express. Travelers are able to book Bluewater Express ferry tickets through Easybook which has quite a number of ferry operators and various ferry tickets online you can choose from. You may experience the cost-efficient high-speed ferry from Mersing to Tioman when you book your ferry ticket for Bluewater Express via Easybook. 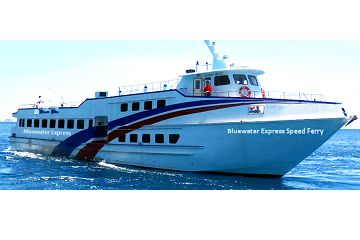 Blue Water Express provides service that specializes in high speed boat transportation which takes about 1.5 to 2 hours to reach Tioman Island by boat. They are the main provider for ferry trips mainly to Pulau Tioman. Bluewater Express emphasizes on safety, professionalism and guest satisfaction for all their services. This ferry operating to the Tioman route is fast and efficient with the boats being fully air-conditioned for the comfort of each traveler who have chosen to ride with Bluewater Express. As it is considered to be one of the most reliable and affordable sea transportation services for tourists, the one-way trip standard rates provided by Bluewater Express fast boat service are priced at RM40.25 for adult and RM34.50 for child. The ferries depart from Mersing Jetty in Johor which acts as the gateway to Pulau Tioman in Pahang starts as early as 6:30 AM onwards with the last ferry leaving at 5:00 PM, but this depends on the availability as well. Take note that there are several pick-up stops along the island including Kampung Genting, Kampung Paya, Tekek, Kampung Air Batang and Kampung Salang Jetties. There are no ticketing counters available on the islands, so you are required to book round-trip tickets for Mersing > Tioman > Mersing as single trip tickets are not available. You can get to the Mersing jetty by bus or you can choose to drive as there are public carparks conveniently located nearby. Beside the ferry rides, Bluewater Express also provide special services to help tourists reserve accommodations in Berjaya Tioman Resort to ease the visitors travel plans in order for them to simply enjoy a comfortable and pleasurable stay in Tioman Island upon arriving. Pulau Tioman is a very famous spot for tourists to explore the nature, clear water and magnificent undersea view. This island located by the east side is an excellent place with fun-filled water sport activities in which visitors can go for scuba diving, snorkeling, boating, water skiing, windsurfing, kayaking and deep-sea fishing. You can also simply enjoy the beauty of the undersea gardens or go sightseeing around Tioman by hopping onto a boat to go around the island. Pulau Tioman is the biggest island along the east coast of Peninsular Malaysia, there are few villages around. They include Kampung Genting, Kampung Paya, Tekek, Kampung Air Batang and Kampung Salang. Tekek is the main village that acts as the town for Pulau Tioman. All major infrastructure and amenities can easily find out here such as banks and duty-free shops with the airport, marina and the main jetty located within nearby. There are many accommodations you can find on the island that caters to all types of travelers. If you looking for a luxurious stay, you may consider 5-star resorts like Berjaya Tioman Resort, Japamala Resort or Bagus Place Retreat for an unforgettable stay. If you looking for budget accommodations, you may head to the Salang and Air Batang side with numerous budget chalet with affordable price for you to choose from. As a friendly reminder, there are a special travel period to Tioman. The best time to visit Tioman Island is during the middle of the year which is around April to July as you will be able to experience the perfect weather during. Many resorts and water activities will be closed due to the northeast monsoon between the end of October and the beginning of March. You will find an irregular ferry departure schedules during this time as well. Make sure you plan early when you visit during the peak seasons in order to enjoy the sunny weather and clear water of the ocean. ATMs are available on the Tetek village and Mersing Jetty, so make sure you bring along enough cash for your trip to Tioman. Most of the diving centers accept credit cards as well. If you want to get your diving license, make sure you make the necessary arrangements beforehand to avoid disappointments. Make Tioman Island as your next holiday destination to enjoy the sea breeze, white sandy beaches and other exciting activities. Kindly check out Blue Water Express ferry ticket full schedule available on Easybook or download our mobile app for free to be able to book them wherever you may be. You can do it easily using Easybook’s website by following a few simple steps here. We look forward to serving you soon!